Saturday I took a drive with a dear friend and visited the Boulevard Market in Tecumseh, Michigan. I’d found them on the web by searching for “Michigan Cheese,” and when I found out what all they had to offer, I knew I had to make a trip even though my relationship with dairy foods is strained, at best. The shop offers a wide selection of gourmet cheeses from around the world. John himself several varieties, including mozzarella, chevre, a French-style blue (softer, more like brie, rather than crumbly in the English style), a soft herbed cheese called Northern Lights, and a few others. Selection varies daily; John supplies some restaurants as far away as New York with his cheeses and some days they take his entire stock of certain varieties! Both the Aylwards were wonderfully friendly, doling out slivers of this and tastes of that to the crowded store’s patrons. I pestered Erika with questions, which she took in stride, telling me about the cheeses, their origins, and offering samples upon samples. For the cheeses they make in-house (under the Four Corners Creamery brand), only the herbs come from more than 50 miles away. The herbs come from Europe, where they are processed in a way especially conducive to cheesemaking that US-grown herbs are not. The shop also has a nice selection of wine, beer, and spices, most of which are not local, but very tasty-looking nonetheless. While we were there, live music was being played and over a dozen people came in to sample, browse, and buy treats probably destined for the Thanksgiving appetizer tray, as ours were. After we’d made our purchases and I told John about this blog, he offered to show us the cheese kitchen! We took a quick tour; it’s hard to believe so many good things come out of such a small place. As you’d expect, it was sparkling clean stainless steel, right down to the large milk cans that John uses to tote his fresh, raw milk from the farm to his kitchen pasteurizer. There were logs of goat cheese draining in what appeared at first to be a bundle of uncooked spaghetti noodles, but what turned out to be a device similar to a sushi-rolling mat that lets the cheese be formed properly and drain excess whey. All the cow milk comes from one farm a few miles from the store, where third-generation dairy farmers tend a herd of about 120 cattle. The cows live in a real pasture, though this being Michigan, their diet is supplemented in the winter when the grass quits growing. The goat milk comes from one of the few USDA-approved goat dairies in the state – about 50 miles away between Jackson and Lansing. When is your next cheese-making class? What are the requirements to attend same? 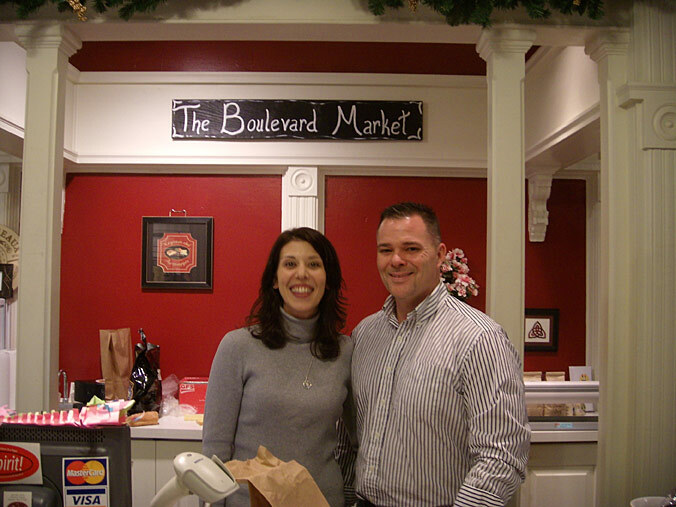 Bob – You’ll want to contact the store directly at 517.423.6000. http://www.boulevardmarket.com/ I’m not affiliated with the store. i am interested in taking food classes. i am interested in your food classes……nov 10th ? your place sounds great, do you offer cheese making classes ? Just a note – I do not own this business. Please contact the market directly with inquiries. That being said, I DO teach the occasional cheesemaking course! See http://preservingtraditions.org/calendar.html for my current list of classes.